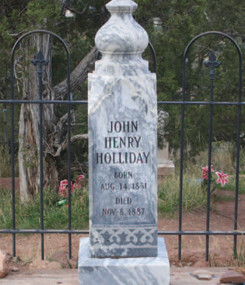 As the story goes, John Henry “Doc” Holliday (he was a dentist by trade and training) passed away on the chilly morning of November 8, 1887, and was buried later that day in the Linwood Cemetery in Glenwood Springs, Colorado. The local newspaper noted his passing and the place and time of his burial, along with mentioning that his family in Georgia would be notified through his “only correspondent, a nun living in Atlanta.” The nun was his first cousin Mattie Holliday, who had taken orders in Savannah and was known as Sister Melanie. His obituary mentions that his last belongings would be sent to her. But the story doesn’t stop there. According to historians in Glenwood Springs, someone moved Doc’s body from its original burial site in Linwood Cemetery – and no one knows where he went from there. The city of Glenwood Springs has erected a monument on an unknown grave in honor of his time there, with the inscribed words: “This memorial dedicated to Doc Holliday who is buried someplace in this cemetery,” giving visitors a place to lay their offerings of playing cards and crushed beer cans. It’s an interesting tourist site, if not a peaceful final resting place. But how do you lose a legend like Doc Holliday? The question may have an answer in the history of Griffin’s Oak Hill Cemetery, established soon after the city was founded. The oldest part of the cemetery, known as Rest Haven, lies north of Georgia Highway 16. Doc Holliday’s sister, Martha Eleanora, who died as an infant before he was born, is buried there. When that portion of the cemetery began to fill up, the land now to the south of Highway 16 was developed and contains the graves of some of Griffin’s most famous former citizens. And most notable of all may be one that isn’t even marked, but is said to be the grave of John Henry “Doc” Holliday. As Glenwood Springs has a story of Doc being moved and then lost, Griffin has a story dating back to the end of the 19th century about someone, likely Doc’s father Henry Holliday, having him moved from Colorado and returned to Georgia to be reinterred in his old hometown. The Griffin story was told and passed down by the sextons of Oak Hill Cemetery, whose job it was to maintain the grounds and oversee the graves. If a family wanted to leave a grave unmarked, that was their right, and they could pay the sextons to keep an eye on things. According to the Griffin story, this is what Doc’s father did, paying for the keeping of his son’s grave. Considering how Doc is honored (or dishonored) in Colorado, his ghost must surely prefer the quieter sleep of Oak Hill. 1851: The year that John Henry “Doc” Holliday was born. He lived in Griffin until the age of 15 when he moved with the family to Valdosta. According to the history on CityofGriffin.com, John Henry “Doc” Holliday was born on August 14, 1851 in Griffin to Henry Burroughs Holliday and Alice Jane Holliday née McKey. He was baptized in the Presbyterian Church of Griffin. Henry was the first Clerk of Superior Court of Spalding County, fought for the Confederate Army in the Civil War and was ranked a Major by the time he left the military.